Oregon is a state in the Pacific Northwest region of the United States.It features rugged rocky coastlines, dense forests, fun cities, mountains, deep canyons, and desert in the southeastern part of the state. Towering peaks, thick forests, fresh air, and pristine water which divide western Oregon from east. Gateway to the High Desert. Cattle, timber and sage country. Spectacular and rugged coastline, modest and affordable accommodations. Beautiful old-growth forests, world-class fishing, breath-taking waterfalls, emerging wine region, gateway to Crater Lake. Home to Oregon's most populous cities, as well as its breadbasket. Painted Hills -- Part of John Day Fossil Beds National Monument, 75 Miles East of Bend, approximately 1000 Ha, 3132 Acres, one of the most photographed areas in Oregon. Colors change as the sun moves in the sky, making an extended visit quite worthwhile. Brilliant yellow wildflowers bloom in rivers of color down the "valleys" of the hillsides in late April/early May. Oregon National Historical Trail -- As the harbinger of America's westward expansion, the Oregon Trail was the pathway to the Pacific for fur traders, gold seekers, missionaries and others. Willamette National Forest -- Offering numerous outdoor recreation activities including hiking, sailing, and camping at Waldo Lake. Wallowa Lake -- One of Oregon's finest lakes. Beautiful scenery, camping, boating, fishing, hiking, eating, and lodging in the quiet town of Joseph. Silver Falls State Park - Located 26 miles East of Salem this state park has 10 waterfalls. Take the canyon trail on a 6.9 mile hike and see all 10. For a shorter hike take the shortcut and see 8 waterfalls in a 5.1 mile loop. Mill Ends Park in Portland, the smallest park in the world. Bend -- a popular destination for year-round outdoor recreation centered around a vibrant town with award-winning restaurants and unique shops, located on the dry side of the Cascade Mountain range in the high desert. If driving in Oregon, be aware of a state law that does not allow self-service at gas stations. A gas station attendant must pump the gas. Also, be aware that the name of the state is pronounced "Ory'-gun"; Rather than 'or-eh-GONE'. Redmond Roberts Field(RDM) serves the Redmond, Bend, and Madras areas in central Oregon. For most of eastern Oregon, the Boise Airport (BOI) in Idaho is the closest. Tri-Cities Airport in Pasco, Washington (PSC) is also nearby for locations further north, but still east of the Cascades. Portland International is served non-stop by most major airlines and by several international carriers. It is the only international port of entry for Oregon, with daily non-stops from Tokyo, Amsterdam, and a few Canadian cities. Delta  now offers a regular non-stop service to Portland from London Heathrow. The three smaller airports are served non-stop by feeder lines to Portland and other regional hubs such as San Francisco, Seattle, Las Vegas, and Salt Lake City. Salem Airport no longer has passenger service. The Empire Builder  runs between Chicago and Spokane, Washington, where it then splits, with half of the train continuing to Seattle, and the other half to Portland. The Coast Starlight . Regarded by many as America's most scenic train ride, the Coast Starlight runs between Los Angeles, California, and Seattle, Washington, stopping at many Oregon towns including Portland, Salem, Albany, Eugene, Chemult and Klamath Falls. Amtrak Cascades . The Cascades is a special service that operates between Seattle and Portland 4x daily. Twice daily from Seattle to Vancouver, BC and from Portland to Eugene using special high-speed Talgo rolling stock. Oregon stops include Portland, Oregon City, Salem, Albany & Eugene. Additional service to Eugene & Vancouver are on the Thruway Motorcoach buses. For more information, see Amtrak's website, Wikitravel's article Rail travel in the United States, or the Wikipedia pages on each of this train services. 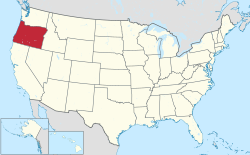 Interstate 5 connects Medford, Eugene, Salem, and Portland, running north to the Canadian border of British Columbia, and south through the Willamette Valley all the way to San Diego, California, therefore connecting Canada and Mexico via 3 west coast states. Interstate 84 connects Portland, The Dalles, and Pendleton, running southeast to Salt Lake City, Utah. Interstate 82 connects Hemiston/Umatilla (from Exit #179 along I-84), Tri Cities, and Yakima and into I-90 at Ellensburg, Washington. Highway 99 is the predecessor to I-5, but goes through many towns in the Willamette Valley. At Junction City (just north of Eugene), it splits as 99E and 99W which meander along the respective sides of the Willamette River; both terminate in Portland. South of Eugene, it is the same as I-5. Highway 97 is the main Central Oregon north/south route. When I-5 is closed by winter storms, this is usually a good alternate as it is east of the Cascades and subject to much less precipitation. Highway 26 goes from the northern coast through the coast range, through Portland then over the south flank of Mount Hood then generally follows an east-west path tracing the north Oregon border 50-75 miles south almost to the Idaho border at Vale. Highway 20 goes from the north central coast in Newport to the eastern border roughly midway through the state. Highway 395 is the main Eastern Oregon north/south route from Pendleton down through Umatilla and Malheur National Forests, through Lakeview and into Lake Tahoe, CA. Going north the highway goes west along I-84 from Pendleton to Hermiston and up along I-82 to Tri-Cities, WA and up to I-90 at Ritzville. Oregon is one of two states in the U.S. (the other state being New Jersey) a gas attendant must serve gas for you. You cannot serve gas yourself by law. The speed limit along the interstates is generally 65 miles per hour (mph) except in the urban areas of interstate 5 where it is 55 mph. On highways it is generally 55 mph. For more details see Oregon Revised Statutes Chapter 811.111  and 810.180 . The Oregon Coast is a premier destination for cycling, although traffic, narrow shoulders, heavy winds and rains, and windy roads make it dangerous. Nevertheless, many people cycle the entire Oregon Coast each year. In the summer months take Highway 101 north to south starting in Astoria through Lincoln City and onto Brookings to get breathtaking views of the Pacific Ocean. The prevailing winds will be at your back all summer long. For the seasoned cyclist head north in winter months as the winds are out of the SW at that time of year. The Pacific Crest National Scenic Trail (which runs from Canada to Mexico) passes through Oregon along the Cascade Mountains. With almost no civilization along its route and very few highway crossings (four in the northern 150 miles of the trail), it is exceptional for experiencing nature while avoiding civilization. Hundreds of species of birds and wildlife in Malheur National Wildlife Refuge. Southern Oregon has the Oregon Shakespeare Festival, Crater Lake, Rogue River, and Oregon Coast. Raft the Rogue River, Grants Pass. Spend four days rafting the Class III rapids of the Wild and Scenic Rogue River. Camping and lodge trips are available. Enjoy the outdoors by camping at Devil's Lake, Ft. Stevens, Tillamook State Forest or Detroit Lake State Recreation Area. Nearly 40 miles of coastline Dunes at the Oregon Dunes National Recreation Area between Florence and Coos Bay: get sand in your hair by driving ATVs or dune buggies. 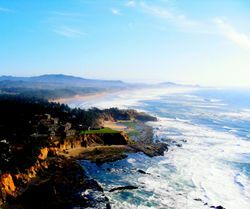 Take a Oregon Coast  getaway or extended vacation. Visit the 363 miles of coastline and sandy beaches. Enjoy your stay at one of the most romantic places in the world. Rock climbing at Smith Rock. Visit Warm Springs Indian Reservation Resort and Casino. Watch a Portland Trail Blazer game. Watch a Portland Timbers game. Watch a Portland Winterhawks game. Go to the Oregon Zoo. Ski or Snowboard on Mt. Hood. In August if you want. Go Bike Riding on the Spring Water Trail or in downtown Portland. Go to the Beach at Lincoln City, Seaside, or Newport. Unlike most US states, Oregon has no sales tax. There is no tax included in posted prices and no tax is added at the till. This is worth bearing in mind if you're planning on making any large purchases during an interstate trip. Four star dining in hiking boots and jeans? This is perfectly acceptable (as are suits and tuxedos) at Timberline Lodge's Cascade Dining Room which offers seasonal northwest cuisine year round. Excellent breakfast, lunch and dinner selections. Dinner reservations are helpful most evenings, but a necessity at holidays and nice summer weekends. From the coastal hamlets to the valley cities to the remote towns of the high desert, Oregonians drink, and proudly. Because of the growing wine and microbrewery industries in the state which produce drink of world-class quality, having a tipple and touring beverage facilities is a popular pastime for Oregon residents and tourists alike. It is occasionally joked that one cannot throw a cat in the city of Portland without hitting a bar (though one shouldn't: the PETA people there can be touchy and rather humorless, especially regarding the hurling of cute little kitties), while most other towns of any appreciable size have at least two places in which one can imbibe. Yes, the drinking culture here is strong, and if you like to pickle your giblets then you'll be in heaven. Oregon is an "Alcoholic Beverage Control State" and as such requires all distilled spirits to be sold by state-approved outlets. Because the liquor stores purchase their wares from the state at an inflated and heavily-taxed cost, liquor by the bottle or by the shot can run your booze bill up pretty quickly. Fortunately, Oregon has no shot size regulation (such as, say, Utah has) and many bars - especially in the Portland area - pour their drinks quite liberally; in fact, a literal three fingers of whiskey is not uncommon if you know the barkeep. Bottoms-up, but don't bottom out! There are no "blue laws" concerning time of alcohol sales other than a daily 2:30-7:00 AM restriction, so if you like "kegs and eggs" for your Sunday breakfast, Oregon's your kind of place. Also, Oregon's alcohol laws are unitary within the state and are wholly overseen by the Oregon Liquor Control Comission (OLCC), so there's no need to worry about dry towns or dry counties. Finally, bartenders in Oregon seem to be a bit more strict about checking ID than those in many other states. This likely due to the aforementioned OLCC, which is known to be nothing short of draconian when it comes to the enforcement of laws regarding the furnishing of alcohol to minors by service workers and punishment under the same. If you look under 30 (or even 40! ), just hand them your ID card / passport before you order because they will ask for it. There is also a total indoor smoking ban in all places but cigar and hookah bars. Oregon has a large number of local microbrews, and several breweries whose beverages are distributed outside the state. Most are happy to host guests for tastings, and many are accompanied by restaurants and gift shops. McMenamin's is a unique network of restored historical buildings that are used as pubs, hotels, and breweries. Locations are distributed throughout the state, including Portland, Bend, McMinnville, and Eugene. Rogue Brewery, Newport, is probably best known for the famous drinking skeleton icon and the related Dead Guy Ale line. Deschutes Brewery, Bend, is one of the larger breweries in the state and is well-known for their Black Butte Porter, Obsidian Stout, and Mirror Pond Ale. Full Sail Ales, Hood River, brew several well-known ales, including Amber, IPA, and Pale Ale lines. Standing Stone Brewery, Ashland, is a gourmet restaurant in southern Oregon with Lager, Amber, and several IPA lines. They also make several unique beverages such as an Oatmeal Stout, a Barley Wine, and a seasonal Wassail. Ninkasi located in Eugene is the single greatest brewery of all time...Bar NONE! In recent years, Oregon has become renown as an outstanding wine producing region in its own right, with a range of temperate climates that allow the production of vintages significantly different from neighboring vineyards and wineries in California. Oregon is particularly well-known for its distinguished Pinot Noirs, and is well-suited to grow Burgundian and Alsacian verietals. A diverse arrangement of climates, though, fosters a range of other grapes throughout the state. Clear Creek Distillery, Portland, specializing in liquors distilled from regional fruit produce. Rogue Brewery has a fledgling - and tasty - distilling operation producing specialty liquors. Information regarding Portland's Distillery Row can be found at http://www.distilleryrowpdx.com/ . Oregonians are fanatically proud of the natural beauty of their state; littering or otherwise causing harm to the scenic beauty - including wildlife - found here is bound to draw attention to you that you probably do not want, up to and including that special type which only an officer of the law can give. That being said, keep in mind that while Portland and the rest of the Willamette Valley is very cosmopolitan and culturally similar to San Francisco and Seattle, Eastern Oregon and Southern Oregon are more akin to Idaho and Nevada; that is to say, quite conservative. Contrary to popular belief, not all Oregonians are liberal, a fact which will become abundantly clear to you on a trip to a place such as Burns, La Grande, or Prineville. 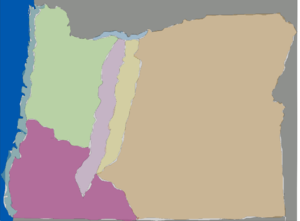 State issues in general tend to be divided along Willamette / non-Willamette lines (that is, large cities within the valley such as Eugene and Portland / smaller cities along the coast, around the mountains, and in the high desert), and some resentment between these groups may be uncovered. The State of Jefferson, a region of southern Oregon and northern California marked by a period of attempted secession during the first half of the 20th century, retains a very independent mindset: Jefferson Public Radio and the State of Jefferson Chamber of Commerce are two indicators of a retained degree of autonomy from this period. Oregonians are known for being exceptionally kind and welcoming people; accordingly, violent crime in Oregon is quite low and visitors are not likely to have any harm come to them during their stay. Be aware, however, that violence has been on the rise in the Portland and Salem areas due to increasing gang activity. Property crime is a problem in any metropolis. For hazards specific to certain cities, please see their respective WikiTravel pages. If you are in need of emergency assistance, dial 911 on your phone. The current laws regarding Marijuana in Oregon are similar to that of Washington, Alaska, and Colorado. Residents or visitors of Oregon can possess up to 1 ounce (28 grams) of marijuana. It is legal to posses up to 1 ounce of cannabis while traveling. And to give as a gift to someone who's of legal age. DO NOT bring marijuana out under any circumstances of the state, into any indian reservation that deemed it illegal, nor any federal enclave. Or you will be charged under both state and federal law. It is Legal for Medical Marijuana dispensaries to sell up to 7 grams of weed and/or up to 4 marijuana clones per day to persons 21 or older (although prices are ridiculous). As for "hard drugs", you're better off avoiding them. Due to the state's awful methamphetamine wave of the 1980's - 2000's, there is very little tolerance in this area and a number of tough laws passed in response to the epidemic will all but ensure that you will be involved with the legal system for a long time to come and at great expense. Another side effect of the state's notorious methamphetamine problem is that any medication containing pseudoephedrine (e.g. Sudafed) is treated as a Class III Controlled Substance of the Controlled Substance Act and thus requires a prescription. This also means that one must prove that they have a prescription to be in possession of such medications, so if one is coming from out-of-state it is a good idea to leave it at home. Psychoactive mushrooms grow naturally here and abundantly, but, of course, possession is illegal. Natural hazards are also few, but include mountaineering fatalities (Mt. Hood in particular). Tsunamis on the coast are very rare, but have occurred; make note of the "Evacuation Route" signs. For information on the state's hazard assessment, visit the NOAA Center for Tsunami Research . Sudden snowstorms in the Cascade Mountains from October to May occur and could lead to increased avalanche danger. The usual perils of desert travel in the Southeastern part of the state could be eminent if you are unprepared, so always follow desert survival guidelines; and rattlesnakes, bears and other wildlife (particularly east of the Cascade range). If you venture out of the Willamette Valley during your stay, be sure that your automobile is well fueled and in suitable condition: while Portland is modern and well-populated, Eastern Oregon includes some of the most sparsely populated areas in the United States. Harney County in the Southeast region of the state, for example, is slightly smaller than Massachusetts but is the home to only about 7,000 people. Breaking down out there will, in best case scenarios, make for a very long and annoying day; at worst, the consequences can be tragic. In rural areas, be aware that many seemingly passable roads are truly impassable for large portions of fall, winter and spring. Apparent routes or shortcuts across mountainous areas and deserts should be validated with locals before attempting - deep snow has captured the vehicle of many a tourist or day tripper who ventured into unknown territory and pushed when they should have exercised better judgment. Finally, as the subject of the vast emptiness of Oregon has been broached, remember to always have an adequate map (Benchmark Maps makes an exceptionally good one), especially if traveling into the wilderness on foot: each year many hikers go on a hike. Several hikers had gotten lost while on the trails. Sadly some hikers are either never found or found dead. Law Enforcement is provided by the Oregon State Police. Oregon State University offers a Saferide Program  throughout the week. Washington State - Oregon's northern neighbor offers amazing natural scenery, from the imposing Mount Rainier to the rainforest of Olympic National Park, as well as the quirky culture of cities like Seattle. Idaho - Oregon's eastern neighbor is a rugged state, with snow-capped mountains, whitewater rivers, forests, high desert, and plenty of wilderness. Nevada - The Silver State borders Oregon to the southeast and is home to the adult playgrounds of Las Vegas and Reno as well remote desert and mountain landscapes. California - Located south of Oregon, America's most populous state is home to Hollywood, the free spirits of San Francisco, and diverse natural wonders such as Yosemite National Park, Death Valley National Park, and the rugged Central Coast. This page was last edited on 7 April 2019, at 17:53.